I wake up almost every morning with a song stuck in my head. Sometimes it’s something totally irritating (Ke$ha, I’m talking to you) and I want to render myself deaf from the inside out (on these mornings I’m convinced that Kevin somehow subliminally plants earworms in my subconscious while I snooze. He’s REALLY good at torturing me that way). Usually, though, whatever song it is tends to reflect my mood. Today’s song, which I also belted out in the shower, was “Fly Me To The Moon”. Any day that starts out with Sinatra is probably going to be a pretty decent day. I hit the chorus as my conditioner sat on my head, and it dawned on me that I have never been as happy as I was right at that moment. Now, I’ve always thought I’m a pretty happy girl (let’s just say that I don’t wake up with a lot of Morrissey running through my head). I have an awesome life: I live in a spectacularly wonderful town by the ocean, I have a roof over my head and food to eat, I have a beagle who is neurotic (in a hilarious way), my husband has a terrific job with an excellent company, I’ve had wonderful opportunities to see parts of the world that most people only dream about…..Yeah, those things alone add up to a nice little package. But here’s the deal: Those things are the little things. They’re the pretty and shiny things on the surface. The foundation of my happiness is SO much deeper. I have friends who have stood by my side for more than half my life. They know where the bodies are buried, but I know they won’t tell. I have an incredible family who love and support me no matter what my flaws. I have a husband who kisses me goodbye every. Single. Morning. before he leaves for work (which, come to think of it, could very well be when he plants those pesky earworms). They say that girls grow up to marry their fathers, and I’m so proud to say that I did just that. My Dad is smart, funny, and he taught me how to embrace life’s opportunities, and I couldn’t ask for a better gift than that. I have a mother who, by example, taught me the skills I needed to be a mother myself. Finally, (and by God, I do mean FINALLY! ), I have a child whose smile stops my whole world. I have a lot to be thankful for this year (and every year), but the biggest blessing I’ve EVER had is my baby boy. Watching him not only adapt but thrive is the single greatest joy I’ve ever known. He picks up our quirky personality traits and makes them his own without ever losing a single piece of who he is. He’s loving, inquisitive, and just about the smartest kid I’ve ever seen. He has amazing lung power when he cries, and he does a mean Hulk impression when he’s angry. He doesn’t care when I belt out songs frighteningly off-key, either, which is a huge plus. I will never grow tired of watching him discovering his world and who he is. Mostly, though, I have never known love like I do when he hugs me. I love Thanksgiving because it’s the one day of the year where people vocalize their gratitude. I’m thankful every single day for the blessings in my life, and I don’t say that as much as I should; none of us do. John F. Kennedy once said that “As we express our gratitude, we must never forget that the highest appreciation is not to utter words, but to live by them”. I woke up this morning with a song not just in my head, but in my heart. Most of my days start out just like that. There is nothing on earth big enough to contain the gratitude I have for that one simple fact (even when the song is by Ke$ha). Yes, the foundation of my happiness is planted deep and true, and I have all the motivation in the universe to live by my words. Ah, yes. It’s finally time to tell the story of the actual trip. Don’t worry; I won’t bore you with the details of the interminable flight over. Just know that Jacksonville is a loooooong way from China. The trip over took just over 30 hours, and we were fortunate enough to have in-flight internet for the domestic portion (JAX-SeaTac). Sadly, there was no such diversion on the leg from Seattle to Beijing, which kind of sucked since we needed something to take our minds off the fact that we were just days away from meeting our son. We made do, though, and I was unreasonably excited that we flew over Dutch Harbor and Kodiak, especially since King Crab season was underway. I waved down to SIg and the boys, and soon enough, we touched down in Beijing! First, let me say that the approach to the Beijing airport takes FOREVER. Also, the city is ginormous, and absolutely gorgeous at night. We breezed through immigration and customs (Dude. SO easy! Miami should take notes) and were met by our guide, Jerry. He got us straight out to our waiting chariot, which was driven by a surly man with a clear death wish. I’m convinced you HAVE to have a death wish to drive in Beijing. One of the perks about arriving at midnight, however, is that traffic is only *slightly* terrifying, and we made it safely to the hotel where Jerry made sure we had everything we needed. We quickly crashed and slept like logs. The next morning we got up, ate breakfast, and met Jerry down in the lobby (the other perk of a late arrival into China is the absence of jet lag. Seriously. We were both totally fine). We headed out for a full day of sightseeing. Our first stop was Tiananmen Square. Jerry gave us LOTS of history before we even made it over there, and we saw a LOT of soldiers. Not police, but soldiers. They march EVERYWHERE near the Square. I also couldn’t help but notice just how precisely the branches of each willow tree were trimmed. They were all exactly the same length, which I’m sure was a huge pain, but man, it’s pretty! We were treated to a lengthy dissertation on the monuments in the largest public square in the world, and Jerry spent a few more minutes extolling the virtues of Chairman Mao, and then we crossed the street into the throng. Thankfully, it was a weekday, so it wasn’t too crazy. The line to get into the Chairman’s mausoleum was only about 3 hours long (yeah, we skipped that part). 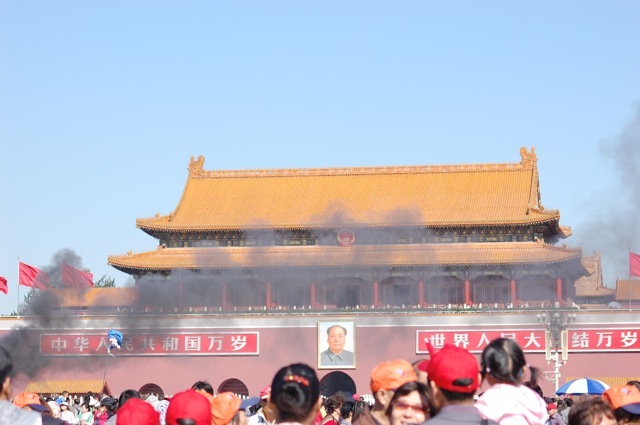 There isn’t too much to say about Tiananmen Square. It’s big. It’s, well, square. There are a couple of monuments. 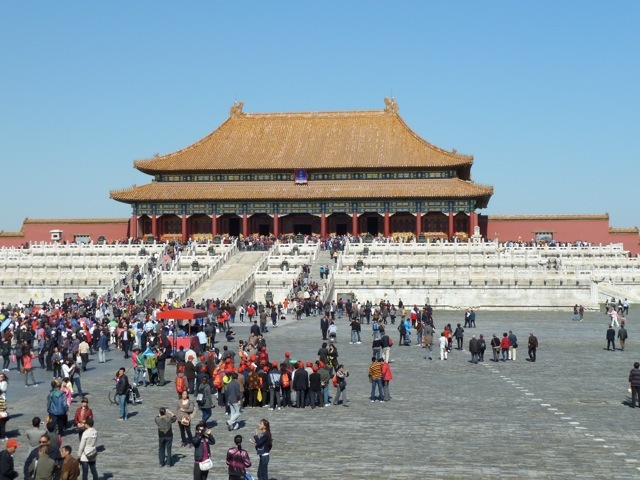 It’s flanked by government buildings and The Forbidden City. Mostly, though, it’s just square. Very, very square. 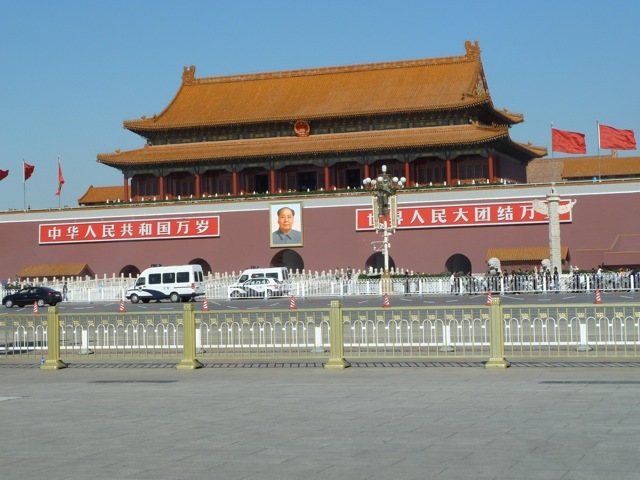 One thing of note did happen, though, just as we were making our way to the gate of the Forbidden City. All of a sudden, out of nowhere, a police car “caught fire”, and by “caught fire”, I mean somebody tossed a molotov cocktail through the car window. Jerry was a little horrified by it, but it didn’t stop him (or us) from getting as close as we could so we could see what was happening. As we approached the gates, however, there was a whole battalion of soldiers there pushing us back, and you could hear the whir of about 1,000 strategically placed cameras recording the scene. As quickly as it had started, the fire was put out (seriously. NYC could take lessons from just how quickly the whole “incident” was squashed. By the time we walked to the other side of the street via an underground passage, it was totally cleared up and traffic was moving normally. The whole thing was done in under five minutes), and there was a whole lot of the Chinese version of “Move along, folks. Nothing to see here”. We found ourselves at the most well-known entrance to the Forbidden City, directly under the MASSIVE portrait of Chairman Mao (the thing weighs in at 1.5 tons). This is probably the picture that everyone has in their heads of both Tiananmen Square and the Forbidden City itself. 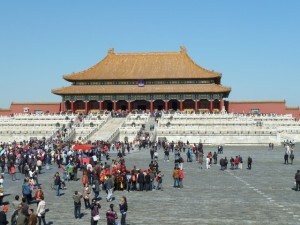 It is the Wumen Gate, also known as the Meridian Gate, so named because it is located on the central axis of Beijing. Also, note the complete and utter lack of people in the picture below. Holy evacuation, Batman! I won’t go into too much detail (I could spend hours explaining the significance of the number of posts inserted above gates, or doors, and don ‘t even get me started on the significance of numbers) about the architecture (amazing), beauty (stunningly gorgeous), or the massive scale of the place (dude. It’s HUGE. There’s a reason why the refer to it as a city), but I will say that I’m so glad I got to experience it firsthand. Most of the jewels and treasures are now located in a museum in Taiwan, so there are mostly just empty halls, but the buildings themselves are spectacular and treasures in their own right. I will note that it was our first encounter with high thresholds; you REALLY have to make an effort to step over the 12 inch (or more) barriers in doorways. These are meant to keep ghosts from being able to enter rooms. Ghosts, it seems, can glide and even run, but they lack the ability to step over obstacles or jump. Good to know. Also, I know there is one very important subject that I haven’t touched on yet. I know, I know, the question is burning. The answer is YES. I did, in fact, encounter my very first squatty potty. 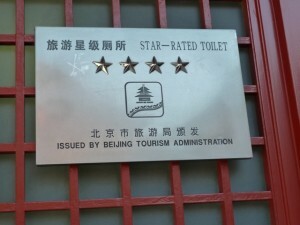 Luckily for us, Jerry steered us toward the Four Star-rated restrooms. I still had to bring my own paper, and I still had to squat, but it was clean, and I was VERY proud of myself for conquering that particular insecurity. It gave me all the confidence in the world, and by the time we boarded the plane for the US, I was the master of the squatty potty! After the Forbidden City, we took a quick break for lunch and then headed to the Pearl Market. Kevin got to fish out his own oyster, and we got a crash course in pearls. We learned everything from the history to how to tell real pearls from fake ones. 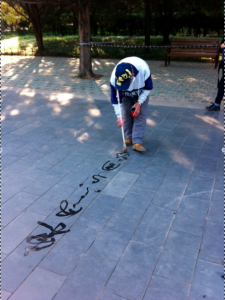 We (okay, I) did a little shopping, and then it was on to the Temple of Heaven. 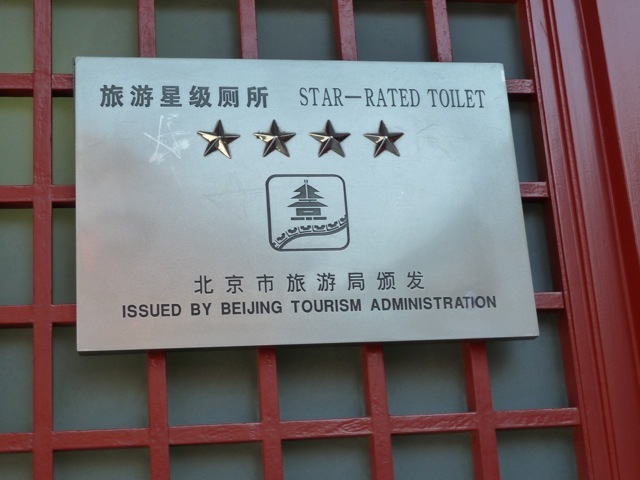 There’s definitely a reason that this is the symbol of Beijing; nothing I’ve ever seen comes close to the splendor of the grounds of the Temple. There are beautiful parks surrounding the central buildings, and we saw men doing water calligraphy, which I could have spent all day watching. It’s elegant and simple, and there’s a poetry in the motion. One interesting tidbit about the temple (okay, two, and then I won’t bore you anymore): There are no nails used ANYWHERE in the construction of the Hall of Prayer For Good Harvests ( I LOVE the Chinese names for things; they’re so lyrical), and the central pillars were replaced after a fire in 1889 by massive trees shipped from Oregon. Really. Most importantly, though, I got to scratch another item off of my personal bucket list. We made an offering at the Temple of Heaven, and that was one of the highlights of my entire time in China. We took a quick break for coffee (I ordered iced coffee and actually braved the ice against ALL advice. I was totally fine; in fact, I ordered drinks with ice for the remainder of the trip and never had a problem. I even–GASP–brushed my teeth with water straight from the tap. I know, I’m a rebel), and then we headed to the Kung Fu show. Kevin was super excited about it, but it turns out that I actually liked it more than he did. 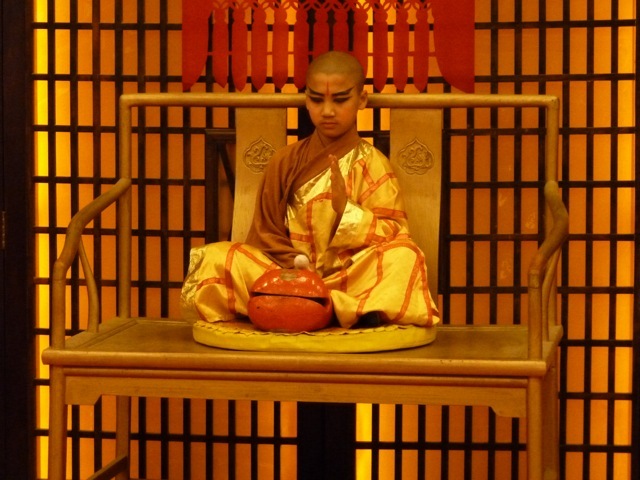 It wasn’t just a bunch of kung fu; it was an elaborate production that told the story of Chun Yi, a young warrior on the path to become a kung fu master. Read more about the show here. From there, we told Jerry that we were up for a traditional Beijing-style dinner, and he willingly obliged. He took us to a noodle house where we filled up on some pretty awesome homemade noodles. It was pretty cool to watch the cooks carrying HUGE trays of fresh noodles down to the woks. It was crowded and noisy, and *exactly* what China is all about. We loved it. So there you have it: 1,250 words JUST about Day 1 in China. In typical Griswold–look kids! Big Ben! Parliament!– fashion (although my Mom would say that I was just being my normal Julie The Cruise Director self), we managed to see a little more than half of the good stuff in Beijing in a single day. We had one more full day to spend in the city, and we still had the Great Wall to check off the list. One more quick thing of note: I’m fairly certain that our days were purposely designed to wear us the hell out so we would be too tired to obsess over the fact that we were mere days away from meeting our precious boy. For that, I am eternally in Jerry’s debt. 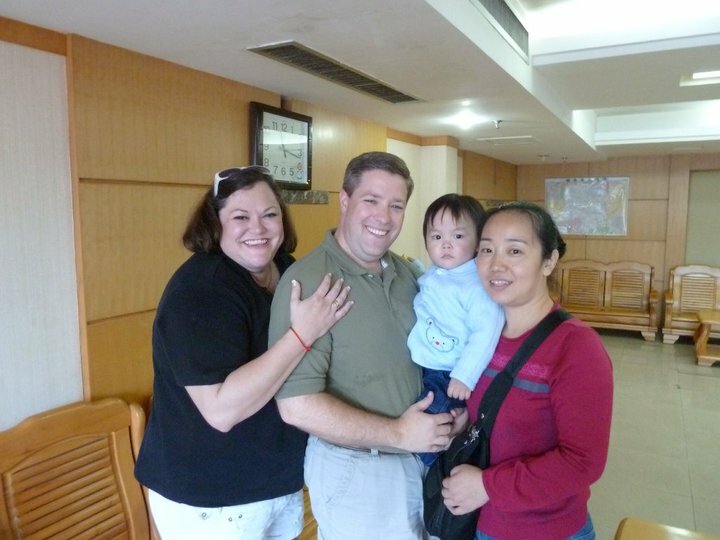 For those of you keeping score, Kevin and I started the adoption process almost five long years ago. In fact, it was about this time in 2005 that we decided to commit to the process (although we didn’t tell our friends and family until quite a few months later). The last time I checked, most women are typically pregnant for 9 months. That means that they have a mere handful of weeks to plan a nursery theme, obsess about names, buy baby clothes, read child-rearing books…..You know, all the usual stuff. I’ve had FIVE YEARS. We’ve changed nursery themes twice (granted, it was because surprise! we had a boy, but still), we’ve debated every single baby name in existence as well as a few that aren’t, we’ve bought enough clothes to make Suri Cruise look like a vagrant, and I’ve read just about every book ever published about children and adoption. Additionally, I’ve spent the last five years learning everything I possibly could about China (and I’m SO glad I did. That “squatty potty” research really paid off!). Mostly, though, over the last five years I’ve learned to squash any and all sense of hope or anticipation. I spent the first year convinced my referral was just around the corner. I studied charts and timelines detailing average wait times. I did MATH, for crying out loud (like real math, too, not just simple addition. I DIVIDED stuff. By HAND. With no calculator). After the first year, though, and my extensive mathletics, I came to the ugly realization that we were in for a VERY long wait. Sometime during the beginning of the third year, I learned to let go of anticipation. I stopped stalking China adoption websites. I withdrew from the message boards. I screamed in my head EVERY SINGLE TIME somebody asked me if we were still planning to adopt or why it was taking so long. I buried my hope so deep that I convinced myself that it never really existed. And in doing so, I was able to go on living my life. One of my favorite verses is Hebrews 11:1, which says that “Faith is the substance of things hoped for, and the evidence of things not seen”. My faith wasn’t gone, but it was getting *really* hard to find the substance of things hoped for. And then we entered Year Four. It started regularly enough: Time at the beach, walks with The Beagle, the usual. One day at the end of March, everything started to change. I saw my son’s picture for the first time. We had 24 hours to lock his profile, and after a very late night discussing it (and his special need. Also? I cannot emphasize this enough: ALL INSTITUTIONALIZED CHILDREN HAVE SPECIAL NEEDS. There. I feel better now) we did just that. Really, we knew from the second we saw his sweet face that he was our son. As soon as we signed our Letter Of Intent, the funniest thing began to happen. My hope began to come back. It was a little like the Grinch looking down at Whoville, really. With every step we completed, my hope grew and grew until it was huge and tangible. It filled entire rooms. It shattered the numbness that had been my self-preservation. Mostly, though, I don’t think I needed the plane ticket to fly to China, since I’m pretty sure I could’ve sprouted wings by the day it was finally time to travel. Soon enough I’ll bore everybody with the actual details of the trip; I mean, we really did see and experience some amazing things. All of it, though (even Chinese WalMart and the Great Wall) takes a backseat to October 18, 2010. People who haven’t experienced “Gotcha Day” (or as we’re calling it, “Family Day”) really have no concept of just how strange and wonderful it is. You wake up in the morning, and it’s just like any other day. You shower, have breakfast (and if you’re me, you remark at the oddity of having goose feet available on the “Western” breakfast buffet), read the news, and then a car comes to pick you up. You’re not headed to the mall or the airport, though, but rather to a nondescript building that sits off of a busy city street. You park, walk up 5 steps, and get in an elevator with a guy who is smoking like a chimney. Three floors later, you emerge into a hallway. On the white wall, in huge gold letters, are the Chinese characters and English words: “Hunan Adoption Registration and Service Center”. You take a quick right into a room outfitted with low-slung bamboo chairs, tables, and couches, and you wait. All this time, though, you feel like you’re moving in jello. Nothing seems remotely real, except for the super-urgent sensation of desperately having to pee. Okay, maybe that part’s just me. You feel like you’re jumping out of your skin, but on the outside, you’re holding up remarkably well. Also? You feel every millisecond of the four and half years you’ve been waiting; in fact, every second that ticks by feels like ANOTHER four and half years. 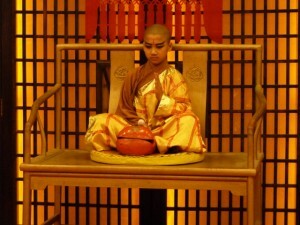 You sit calm and composed, though, as babies are brought into the room. You quickly scan faces, but none of them are yours. And you KNOW which one is yours, because you’ve been obsessing over his picture for the last six months; every dimple, every freckle, every eyelash. And then it happens. J’s nanny came in with two babies, a little baby girl and my sweet boy. Kevin didn’t recognize him at first. I had to point him out. We got up and slowly walked over to him. He shrank back into his nanny, and she tried so hard to get him to come to us willingly. He was not a fan of us at ALL. After a few minutes, though, I couldn’t stand it anymore and I picked him up. He immediately began to wail (duh. Who WERE we, anyway???). She tried to explain that we were his new Mama and Baba, but he was having no part of it. I held him for a little while, then handed him to Kevin (we were both in tears, and I think Jack either thought we were nuts or wanted to petition for different parents at this point). Shortly after that we were able to ask his nanny some questions (you know, important things like naps and poop), and then we were on our own. Parents. Of a toddler. Just like that. Somebody somewhere (including a couple of social workers) gave the go-ahead for us to be parents (although I’m fairly certain that if I had mentioned my deep and abiding–not to mention creepy and a little stalker-like–love of Don Henley then they would have reconsidered). It’s not like being pregnant. If you get pregnant, with or without medical assistance, you still don’t have to run the adoption gauntlet. You don’t have social workers asking about details of your marriage or family relationships or looking in your closets or cabinets. You don’t have to justify your desire or ability to parent a child to various US (and for us, foreign) government agencies. Don’t get me wrong; I actually think that ALL parents should be subjected to the rigors of the adoption process. I think it would *definitely* change some minds, and at the very least, people would get an education in child development and crisis management. In fact, forget watching “Teen Mom”; just have teenagers attempt to fill out the 18 million forms for the adoption process. That’ll work better than any condom would. Oh, okay. You can still watch “Teen Mom”, but you get my drift. My point is that the weirdest and most wonderful experience in the wide world is having someone hand you a child who, until that exact moment, was a stranger to you. We were judged to be two people capable of lovingly parenting a child, and I’m not sure I believed that about myself until the minute I held my son. As soon as I picked him up, though, I knew two things with absolute certainty: This was my son, and I had this whole Mom thing locked. Our journey was a long one, and I’m not just talking about the eternal flight to China. The process that morning though, from the time we got in the car until the time we loaded back into it with Jack, took less than an hour. It’s amazing how quickly four and a half years fell away. Four and half years of waiting, of self-doubt, of fading faith, of hope buried so deep I was honestly afraid it would never again see the light of day….Four and half years vanished in the blink of an eye, and I became a Mom.